Made for combination and oily skins, Edenens Sebo-Balancing Cream Nectar Purifiant targets the source of skin imperfections by diminishing sebum production* thanks to White Willow. Its airy texture melts instantly on the skin while leaving a soft feeling and perfect matte effect. 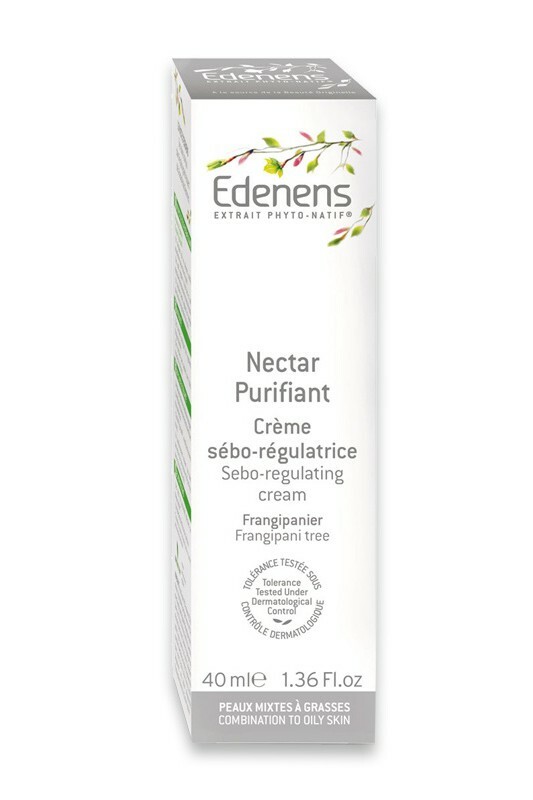 Edenens Sebo-Balancing Cream Nectar Purifiant contains Frangipani Tree Extract to purify the skin while Hyaluronic Acid moisturizes** and clear up pores for a clean complexion and refined skin texture. Phyto-Native Extract feeds skin cells with essential nutriments : peptids, amino acids, minerals... Skin tolerance tested under dermatologist control.Contains corrective powders with a matte finish. Non-comedogenic. * Significant Sebo-Balancing Effect after 28 days of use. ** Moisturization of skin superficial layers. 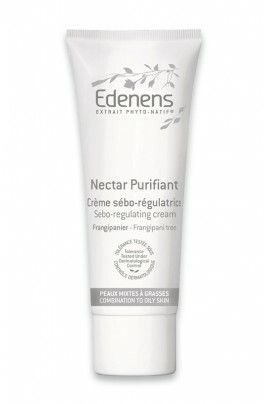 Apply Edenens Sebo-Balancing Cream Nectar Purifiant day and night on perfectly cleaned face and neck. Aqua, Caprylic/Capric Triglyceride, PEG-6 Stearate, Dicaprylyl Carbonate, Prunus Armeniaca Kernel Oil, Coconut Alkanes, HDI/Trimethylol Hexylactone Crosspolymer, Cetyl Alcohol, Ceteth-20, Octyldodecyl Myristate, Polymethyl Methacrylate, Glyceryl Stearate, Steareth-20, Coco-Caprylate/Caprate, Glycerin, Polysorbate 80, Carbomer, Silica, Salicylic Acid, Flavesone, Isoleptospermone, Leptospermone, Salix Alba Bark Extract, Capparis Spinosa Fruit Extract, Plumeria Alba Flower Extract, Hydrolyzed Soy Protein, Fagus Sylvatica Bud Extract, Onopordum Acanthium Flower/Leaf/Stem Extract, Alcohol, Methylpropanediol, Helianthus Annuus Seed Oil, Tocopherol, Sodium Hydroxide, Parfum, Benzyl Alcohol, Sodium Benzoate, Dehydroacetic Acid, Potassium Sorbate, Phenoxyethanol, Benzoic Acid, Sorbic Acid. texture agréable, bonne hydratation pour les peaux à tendance grasse je ne l'utilise pas depuis assez longtemps pour juger de son efficacité mais je la mixe quelque fois avec la BB cream so bio etic et c'est parfait! Bonne crème qui hydrate parfaitement . Pouvoir matifiant excellent mais le seul défaut que je trouve à cette crème est quelle contient du phenoxyethanol.